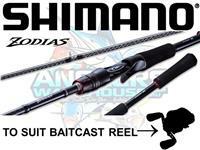 Shimano Zodias Fishing Rod USING SHIMANO’S EXCLUSIVE HI-POWER X CONSTRUCTION GRAPHITE BLANKS, ZODIAS CASTING RODS DELIVER INCREDIBLE DISTANCE AND ACCURACY. THE LIGHTWEIGHT BLANKS ARE COMPLEMENTED BY CUSTOM SHAPED EVA GRIPS, FUJI ALCONITE GUIDES — WITH A FUJI SIC TIP TO REDUCE HEAT BUILDUP AT A KEY POINT — AND A CI4+ REEL SEAT FOR AN ADDITIONAL WEIGHT SAVING. USING SHIMANO’S EXCLUSIVE HI-POWER X CONSTRUCTION GRAPHITE BLANKS, ZODIAS CASTING RODS DELIVER INCREDIBLE DISTANCE AND ACCURACY.